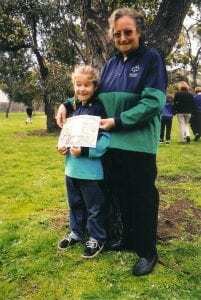 Mum and Sibyle have been friends for ages through the Girl Guide movement where they were both commissioners at some stage and members of Trefoil. 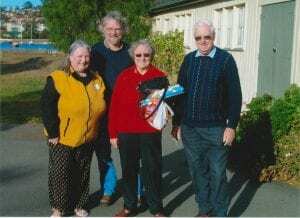 A few years ago they were travelling back from a meeting in Launceston via Evandale where many of my COLGRAVE and DAVEY relatives were born. Mum pointed out a house where her great aunt Ethel lived and mentioned she had brought me up there one time when I was a baby. To mum’s surprise, Sibyle said Ethel was her cousin – in fact they were first cousins once removed. 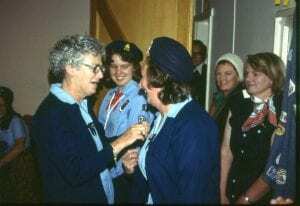 Sibyle presenting mum with her camping certificate and badge when she was leader of Lindisfarne Guide Company. 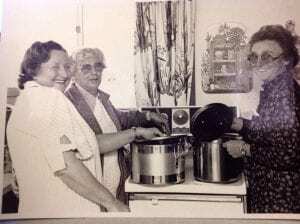 Mum, Sibyle and Aunty Marg cooking up a storm in July 1991. So how are mum and Sibyle related? 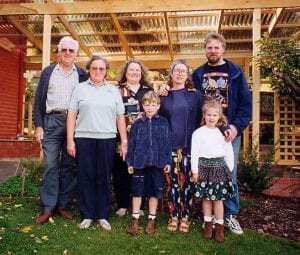 They both share Francis COLGRAVE and Isabella WATKINS(ON) – Sibyle through her grandfather Samuel Colgrave and mum through her great grandfather Francis John Colgrave, sibling to Samuel. Sibyle turned 100 last year and as she is one generation older than my mum, I thought I would ask if I could get her DNA tested. She said yes, so I spent a fantastic afternoon in the nursing home, chatting to Sibyle while she worked up enough spit to put in the tube to send back to Ancestry. Two nights ago, the results came in. Now as 2C1R I was expecting to see mum and Sibyle sharing at least some DNA but when I went to shared matches for mum, Sibyle was not there. Why not? I asked on a Facebook DNA group was it unusual for 2C1R not to share DNA and had many replies but one was from Blaine Bettinger who had written a great post about just this problem. Yesterday I uploaded Sibyle’s DNA to Genesis. This is the next version from Gedmatch. It allows people to compare others who have tested with other DNA companies not just Ancestry. Because of the algorithm used by Ancestry some smaller segments might not be included in their results, so I was hoping those smaller segments would be there in Genesis. More waiting … but using the one to one comparison, I found mum and Sibyle did share DNA but only 18cM over two segments which should mean they relate about 5 generations back. Results comparing mum and Sibyle using Genesis. I then decided to compare the amount of DNA from matches shared by both mum and Sibyle. The results in the table are from Ancestry other than the one where I have Genesis. Readers: Has anyone else had a surprise when there was no DNA when you thought there should be especially with closer relatives? 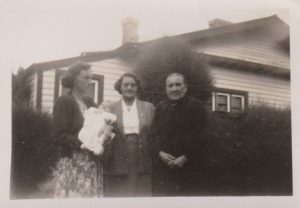 This week in #52ancestors the theme is “Family photos”. 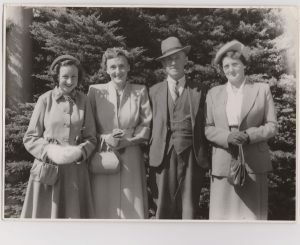 Unsure if this meant any photos taken by a family member or photos of families, I thought I would add a few of both in this post as a gallery of snaps. 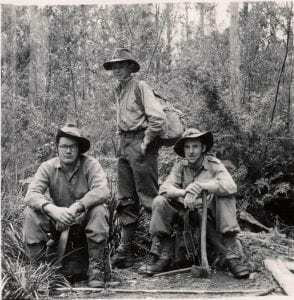 Many of these photos have been used in previous posts. Maybe I should have been a detective! Since retiring from teaching eight years ago, I have started to organize my family history research more carefully. 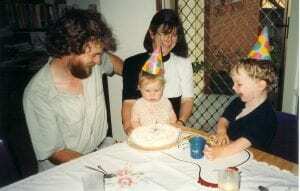 This is mainly because of the DNA tests I have requested from members of my family. I am having to keep better records of what I have done and who are matches to all the people I have had tested. 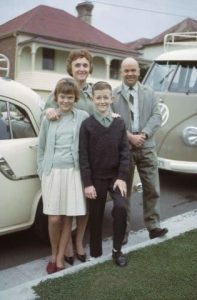 Thanks to UTAS for the Diploma of Family History which I have completed since retirement. They helped with the organizing and planning for my research. At the moment I am working with an as yet unknown 4th cousin with username wollen100. She matches my mother, my brother and me with DNA . It is only a small amount about 21cMs for each of us. But we think it might come down through the BOYD side of the tree. 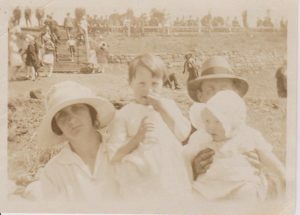 Me, daughter of my mother, daughter of Hannah DAVEY, daughter of Martha COLGRAVE, daughter of Susan BOYD, daughter of John Henry or Holliday BOYD and Martha BOYD , was Virco/Vico nee HEARN. On two birth certificates for John’s children he is mentioned as John Holliday Boyd. Looking on Ancestry, most public trees have his parents as William and Ann Boyd from Ireland. But I think that name Holliday must be significant. Also I noted that John had no children with the name of William. Perhaps a clue that William is not his father. John was a convict tried at the Central Criminal Court in London and sent to Van Diemens Land (Tasmania) in the 1830s. But on the convict conduct record it says his native place was Plymouth which is in Devon in England. I have found a John Holliday Boyd born in 1809 in Maker, Cornwall which is across the river from Plymouth. Parents were Robert Boyd and Nancy Holliday and their marriage was in 1797 in Devon. 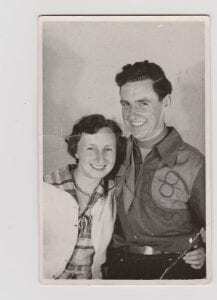 Maybe these are the couple I need to concentrate on to find that connection to my 4th cousin. She has a lot of ancestors in the Plymouth area of Devon with surnames VEALE, WYATT, ELLIOTT, PRIDEUX, WEST, SWAIN and WICKETT. So more research needed to connect my Boyds to one of these names on my cousins tree. I have found an Ann Boyd marrying a Richard Wyatt in 1793 at Ivybridge in Devon. Maybe Ann and Robert are siblings! Come on Sue, get on with that research!! 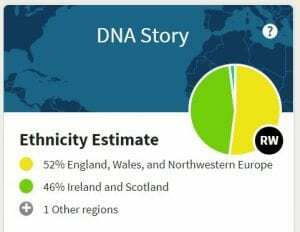 It is from my dad’s DNA testing that I have had a lot of surprises. 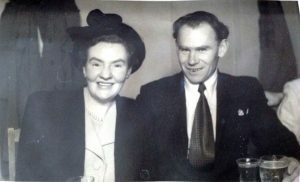 I have been researching my family for over 45 years and thought I had all the paper work correct. Imagine my surprise when I find all these DNA matches to dad that don’t fit into the paperwork I have. The starred matches are those I have as connections in my home database. 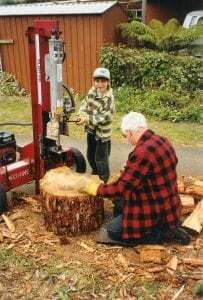 They include myself, my brother, dad’s half brother (another surprise), five 1st or 2nd cousins already known to us, and finally three cousins who I have now connected to dad’s tree. But there is someone who is a 1st or 2nd cousin match who I have no idea about. When I look at the shared matches for that person, none come back to known relatives. So somewhere my paper trail must be wrong. Then I looked at ethnicity. Dad’s great grandfather was half Samoan, so dad and I should have some Polynesian in our DNA – not a skerrick. Those 5 known cousins do from 3-10%. So where is dad’s and mine? Where has all the Irish ethnicity come from? I hadn’t found any Irish in dad’s paperwork. Looks like there have been some lies passed down in the family oral history. Or maybe the truth wasn’t known and it is only now with DNA that the truth is appearing. With dad’s half brother (same father) having done a DNA test, I can now sort dad’s matches into paternal and maternal. But when looking at the maternal matches, I find the unknown 1st or 2nd cousin comes in there. But doesn’t match those with the Polynesian ethnicity. 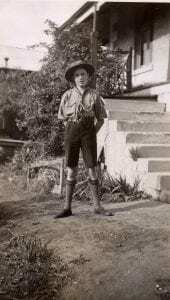 So maybe dad’s maternal grandfather is not the son of the Samoan whaling captain I have researched for years. I have started using the tool What are the odds (part of DNA painter) which allows me to make hypotheses of where dad’s grandfather might be in the unknown cousin’s tree. Looking at the unknown cousin’s tree, there is a lot of Irish in there, but I still need to find which person is dad’s direct relative. 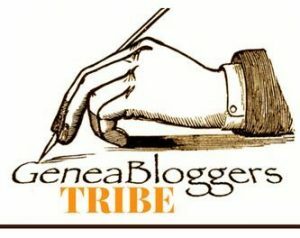 Readers: What surprises have you found in your paper trail and or DNA trail? I had planned to write this post last Friday while I was volunteering at my local library. But I got sidetracked when a person arrived wanting help with their family history. After an hour talking to them, getting them organized with some pedigree charts and family group sheets and giving them some homework (once a teacher, always a teacher), I sat down at the library computer and began doing some research for them. Time sped by and I didn’t get to write this post. Then this morning I received the next prompt and thought – wow I need to get myself together and get this post written. So who in my family has had a relationship with the library? 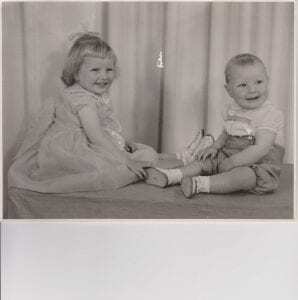 Me, Sue Wyatt born in 1956 in Tasmania, Australia. As a child I loved reading books and the rare times I got into trouble and was sent to my room, it wasn’t really a punishment. Instead lying on my bed, reading a book and my imagination took me to other places. We always had lots of books in the house as dad was also a keen reader, mainly history of Tasmania and biographies of others around the world. We moved house my second year of high school and being a child who didn’t make friends easily, I quickly gravitated to the library during lunch hours. The librarian made me a monitor there so I stacked shelves, took books out for students and helped with the card catalogue (pre computers). It was there and then I decided I wanted to be a librarian. But by the time I got to years 11/12 in college, I found that part of librarianship was pulling apart books – not literally but themes, reasons for doing certain actions etc. I didn’t like this – reading for me was a pleasurable activity – it wasn’t dissecting the book and the reason the author wrote the way they did. So goodbye librarian – hello teacher. 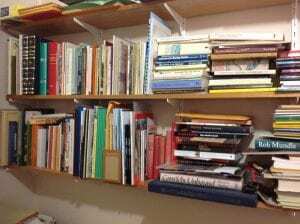 In my 35 years as a teacher, I always had a class library in my classroom – many books I had purchased myself. They were there for students to read during silent reading – but I didn’t mind if they took them home to share with family. Very few were ever lost as the students appreciated having a variety of books in the classroom. I also made sure they visited the school library and used the encyclopedias for research. It is only since I have retired that I have started going back to the library and just before Christmas 2018 I decided to volunteer one afternoon a week at the local library. My specialty will of course be family history. 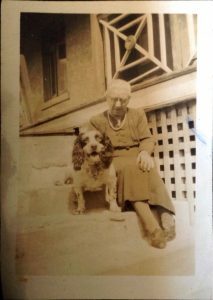 We are extremely lucky here in Tasmania, that most of our family history resources like BDMs pre 1930 are digitized and available online. Libraries Tasmania (previously LINC) have great resources including BDMs, convicts, wills, arrivals and departures all available at the press of a button and part of my volunteer role will be making sure library visitors wanting help with family history know how to use these resources. They have also created a video about using the family history resources.